Good oral health in childhood means healthy teeth and gums throughout life. 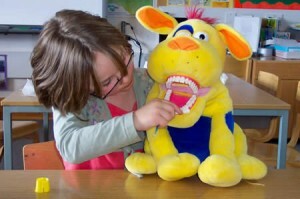 Here at Govan Dental Care we offer the Childsmile Programme for children aged from birth to 6 years old. Many parents/guardians may already have some knowledge of what the Childsmile programme offers, the aims and objectives of what we hope to achieve but for those who haven’t here is a brief outline of what to expect when visiting the practice. Within Childsmile we work to ensure all children regardless of income or background have the best possible start. We understand that many children are very apprehensive when visiting the practice as everything is new, the sights, the smells and the sounds. Each and every member of our staff do their best to ensure the child has the best possible experience by taking our time to show them the instruments we use, the use of study aids such as soft toys and more importantly taking our time to get the child used to the new surroundings. We would never push a child into anything which they do not wish to comply with, they may just not be feeling up to it that day and there is always the next visit to try again. Give information on how teeth grow and develop. Give information and advice on Teething. Provide the child with a toothbrushing pack which contains a toothbrush and fluoride toothpaste. Demonstrate toothbrushing techniques with use of study aids as shown above. Provide information and advice on diet, nutritional needs, breastfeeding, weaning and sugars. For children aged 2years+ fluoride varnish will be applied 2-4 times yearly, this is a banana-smelling varnish with a high concentration of fluoride which is placed on the teeth to help strengthen them and prevent tooth decay. To give your child teeth the best possible start and to encourage good oral hygiene give us a call now on 0141 445 1829 or BOOK ONLINE – Don’t delay call today, your child could be missing out! To learn more about oral hygiene and a range of other treatments and services provided by our team please see our videos. To get in touch with us, call us on 0141 445 1829 or click here here to go to our contact page.